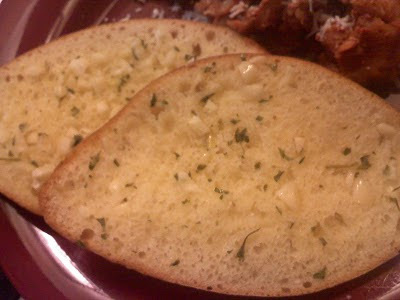 In a small bowl combine butter, garlic and parsley. Cut the rolls in half, and spread equal amounts of every half of each roll. Put the rolls back together, and wrap in foil. Preheat oven to 300 degrees, once heated place the foil wrapped rolls in the oven. Bake for about 15 minutes. Serve warm with your favorite pasta dish. This was a last minute addition to the Crockpot Baked Ziti I made, and we absolutely loved it! We are garlic lovers in this house though. This was very easy, and I will totally be making these again. 4.5 Stars.